While all the peoplel drink their coffee and grab a sandwich for lunch, I snack on some dried fruit and wait patiently to go back home and eat. But if I haven’t cooked anything the night before, I need to make something quick and nutritious. Like this salad for example. Spinach has a lot of iron and protein, while goji berries are filled with betacarotene, and protein as well. Sesame seeds are a great source of calcium while grapeseed oil is rich in omega-3. The taste ? Delicious. 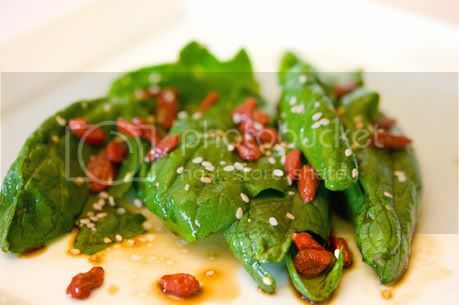 I also love the chewy texture of the goji berries in my salad! Wash spinach well and chop in desirable size. Pour oil and toss. Add goji berries and shoyu. Mix everything together and sprinkle with sesame seeds. Enjoy! Sweet, slightly tart and packed with nutrients, goji berries add that tasty je ne sais quoi to these scones. These Himalayan treats contain numerous amino acids, trace minerals, protein and antioxidants. As if that wasn’t enough, they also contain a significant amount of Vitamins A and C, B-complex vitamins, vitamin E and anti-inflammatory agents! Whew! That’s a lot of nutrition packed into one tiny berry! Talk about bang for your berry. I used rice flour to make these scones gluten free, canola oil and rice milk to make them vegan, and goji berries, cinnamon and pecans to make them delicious! They have a traditional scone texture, while also retaining the perfect amount of moisture. What a tasty and nutritious way to start any day! In order to reach and maintain optimum health and fitness, good nutrition is an essential part of any exercise regime. Skipping breakfast could slow down your metabolism, which could result in undesired weight gain. • 1 tbs of safflower oil, pinch of cinnamon. 1. Preheat oven to 375 degrees F (or 190 degrees C). Grease cookie sheets. 2. Put all ingredients except raisins (or chips) and walnuts in food processor. Mix well. 3. Put in bowl and add goji berries and walnuts, stir. 4. Drop by teaspoons onto greased cookie sheets. Bake for 12-15 minutes. NOTE: Can use parchment paper instead of grease on cookie sheet. Mix the dry ingredients together, then add the milk and eggs. Mix well and try to get some of the lumps out of the batter. Don't worry about making it perfectly smooth. It will be fine. Heat a skillet on medium heat. When heated, scoop the pancake batter recipe into the frying pan with a large spoon to make individual pancakes. The pan will probably only take 1 or two pancakes at a time. Cook on one side until the top begins to bubble, then flip over and cook on the other side. 2. Combine apples,berries and apple butter; arrange in 8-inch square baking dish coated with cooking spray, pressing down lightly to compact. 1. Combine marmalade and orange rind, and set aside. 2. Combine juice and sugar in a medium saucepan; bring to a boil. Add goji ,cranberries; return to boil. Reduce heat; simmer ntil cranberries pop and sauce begins to thicken. Remove from heat; stir in marmalade mixture. Cover and chill. Heat oil in a large skillet over medium-high heat. Add onion; sauté 4 minutes. Add chicken mixture and bell peppers,goji berries; sauté 5 minutes or until chicken is thoroughly browned on all sides. Add broth and salt; simmer, uncovered, 15 minutes or until chicken is done. Combine cornstarch and water in a small bowl; stir well. Add cornstarch mixture to chicken mixture; simmer 2 minutes or until sauce thickens. Stir in cilantro. Serve over rice. Preheat oven to 350. Grease and flour or spray an 8x8 inch baking dish. In a large bowl, beat together applesauce, oil, sugar and vanilla. Stir in flour, baking soda, baking powder and cocoa. Beat until well mixed then fold in the goji berries (with any residual water). Pour into prepared pan. Sprinkle with sea salt. Bake 25-30 minutes or until a toothpick inserted into the middle of pan comes out clean or with only a small, dry crumb attached. In large skillet sauté broccoli garlic and onion in a small amount of olive oil. Add in pasta sauce and simmer 5 to 10 minutes. Add in rotini pasta and goji berries season with salt and pepper. Cook 5 to 10 more minutes until pasta and berries are tender.